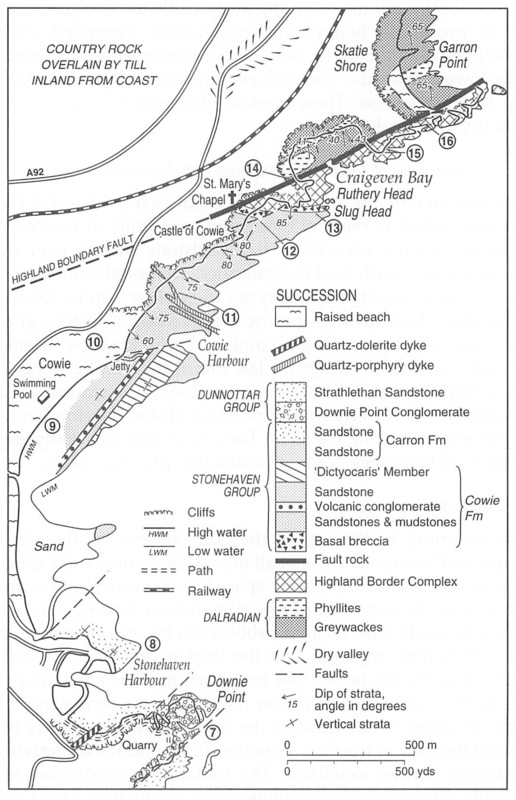 Fife and Angus geology - an excursion. Front cover. 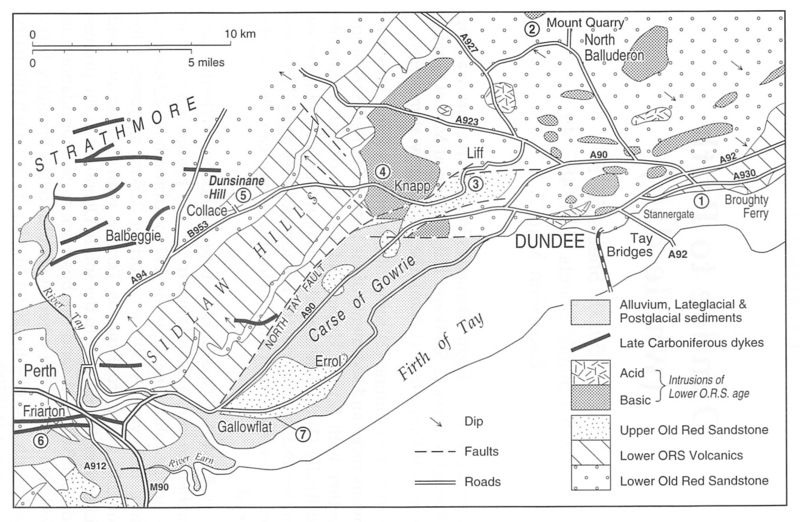 Fife and Angus Geology was first published in 1968, a second edition appearing in 1973. These early editions owed much to the encouragement of the late Professor C. F. Davidson and the critical appraisal of R. Johnston, both of the St Andrews University Geology Department. 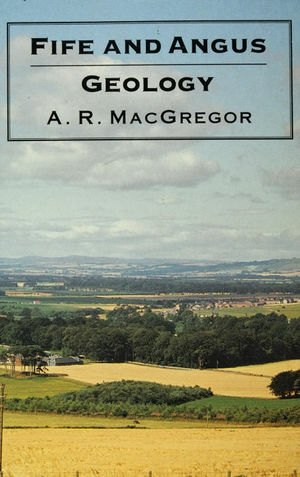 By 1985, however, Fife and Angus Geology was out of print and much new work on the geology of the area had been published. The opportunity was therefore taken to re-write completely the introductory chapters, incorporating new information into all the itineraries, omitting from the guide book the excursions to the area between Stonehaven and Aberdeen and to South Queensferry since both are very well covered by the Aberdeen and Lothian guides respectively, and combining or modifying some of the previous itineraries. Two new itineraries have resulted, one for the North Fife Hills and the other for the area lying between Dundee and Perth. Over the years gentle but persistent encouragement to produce a new edition came from Douglas Grant and many other friends and colleagues and I am grateful to them all for this, as I am to my wife for reading and rereading the manuscript over a considerable period. The manuscript was put on the word processor by Sue Canfield and Margaret Connolly with patience and understanding. 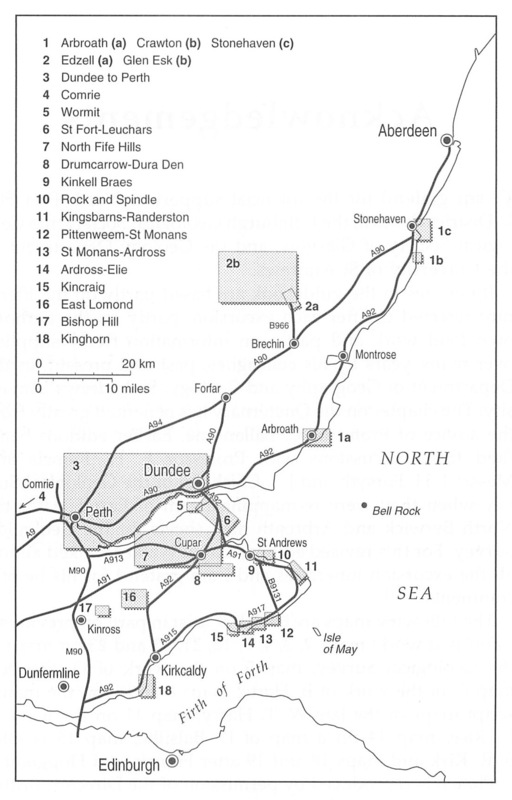 The maps and tables were entirely redrafted or are new, the work of Graeme Sandeman and Janet Mykura of the Cartographic and Graphic Services of the School of Geography and Geology, University of St Andrews. I am grateful for the financial support of North East Fife 1 District Council, the Edinburgh Geological Society, the Geological Society of Glasgow, and the Geology Department of the University of St Andrews. 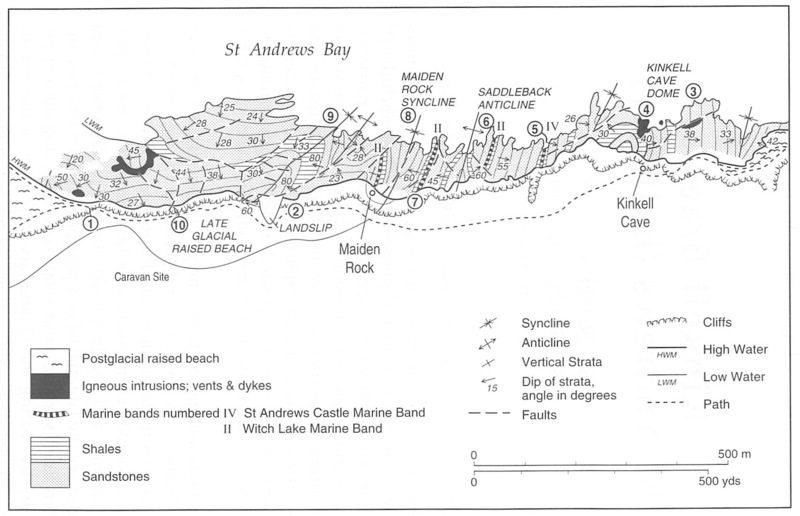 Itineraries in the guidebook are based partly on the literature referred to after each excursion, partly on the author's own field work and partly on information freely supplied over many years by his colleagues, past and present, in the Department of Geography and Geology, St Andrews University. The chapter on the Quaternary has benefited greatly from the advice of Professor C. Ballantyne. 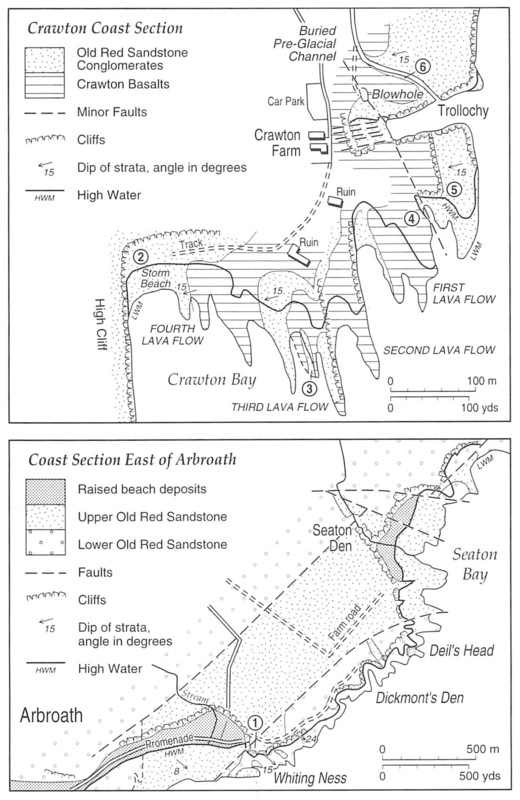 Earlier editions benefited from discussions with Professor E. H. Francis and Messrs I. H. Forsyth and J. I. Chisholm of the Geological Survey when they were re-mapping much of East Fife for the North Berwick and Arbroath map sheets for the Geological Survey. For this revised edition, David Walker walked almost all the excursion itineraries and I am grateful for his helpful comments. The following maps are based, at least in part, on previously published work: (Map 2), (Map 3), (Map 4), (Map 7), (Map 12), (Map 21), (Map 22) and (Map 23) on maps of the Geological Survey; (Map 5) on the work of D. Peacock; (Map 6) on the work of B. Harte; maps (Map 8) and (Map 9) on the manuscript maps of the late W. T. Harry; (Map 11) on the work of C. Rice; (Map 14) on a map of D. Balsillie; (Map 15) is after S. R. Kirk and (Map 18) and (Map 19) after Francis and Hopgood. (Plate 6) is reproduced by permission of the Director, British Geological Survey: Crown copyright reserved. The area covered by the guide book is bounded by a line extending north-west from Kinghorn to Perth and then northeast to the coast at a point just north of Stonehaven, then back down the coast to St Andrews, Fife Ness and along the south coast of Fife to Kinghorn. Two excursions lying outside this area, those to Glen Esk and to Comrie, are included to broaden the range of geology readily accessible from St Andrews. The area includes the south-east corner of the Highlands where a number of glens open onto Strathmore, e.g. Glen Esk and Glen Clova. Strathmore is bounded on its south-east margin by the Sidlaw Hills extending north-eastwards from Perth to Forfar, and those in turn are separated from the geologically similar Ochil Hills to the south-west by the Tay Valley at Perth and by Strathearn slightly further south. The North Fife Hills form a continuation of the Ochil Hills and are separated from the rest of Fife by Stratheden, extending north-east from Loch Leven to the sea near Leuchars. In the southern part of East Fife the hills are relatively isolated, e.g. the Lomond Hills, east of Loch Leven, and Kellie Law and Largo Law further east, while the Binn of Burntisland dominates the south-west corner of the area. The geological control of the topographic pattern soon becomes apparent when the geology and topography are considered together. The Highlands bounding Strathmore to the north-west are composed of durable, old metamorphic rocks and are separated from the rest of the area by the Highland Boundary Fault, a great fracture running south-westwards right across Scotland from Stonehaven to the Clyde at Helensburgh. Strathmore is occupied by Old Red Sandstone rocks in a large syncline running parallel to the fault, the Strathmore Syncline. 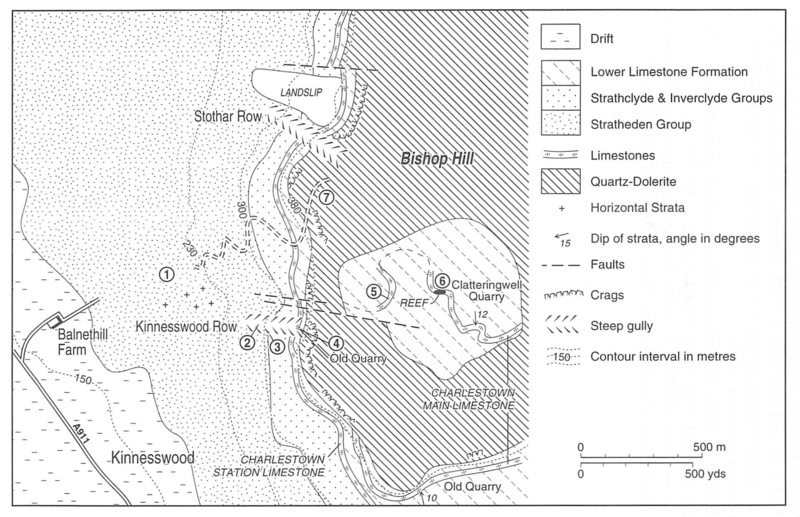 The Sidlaw Hills and the North Fife Hills are composed primarily of lavas of Lower Old Red Sandstone age on either side of the Sidlaw Anticline – another NE–SW trending structure. The resistant lavas have withstood weathering and erosion to form two ranges of hills that can be traced south-westwards until they meet in the Ochil Hills. 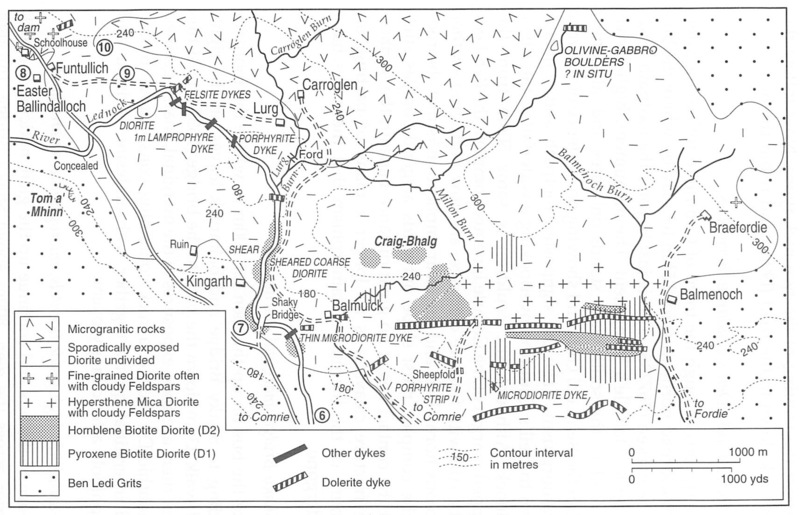 The low ground of the Carse of Gowrie, between the Sidlaws and the North Fife Hills, is occupied mainly by Upper Old Red Sandstone sediments, let down between the North and South Tay Faults in the centre of the Sidlaw Anticline. These in turn are overlain by thin, very much younger, Late-glacial and Postglacial clays in the Tay Estuary. Stratheden is also underlain by soft Upper Old Red Sandstone sediments and is bounded to the north by the more resistant Lower Old Red Sandstone lavas of the North Fife Hills. The southern slopes are composed of Carboniferous rocks, which are also relatively soft. These, however, are protected from erosion by the large Midland Valley Sill which forms such scarp features as Walton Hill near Cupar, the Lomond Hills and Bishop Hill. Standing above this scarp are the peaks of the East and West Lomonds, twin volcanic necks, now little more than deeply eroded stumps. 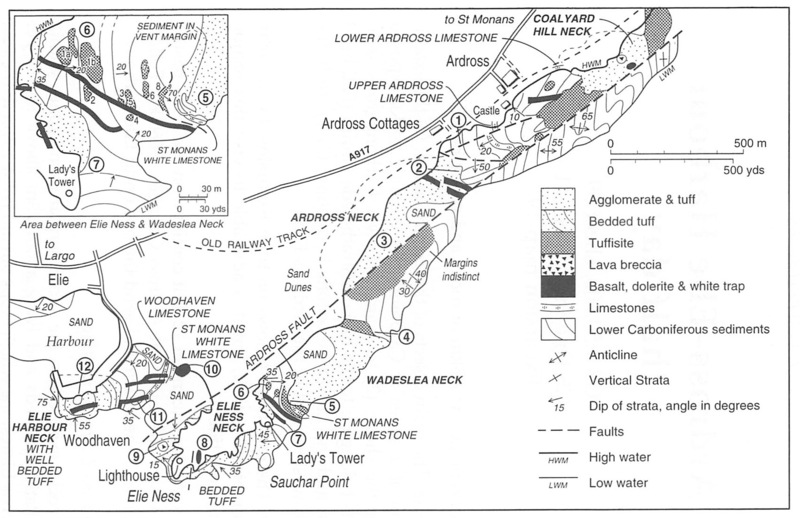 Much of the higher ground between St Andrews and Leven is also capped by dolerite sills, but Kellie Law, Largo Law and Kincraig at Elie are three other old volcanic necks, see (Map 2). 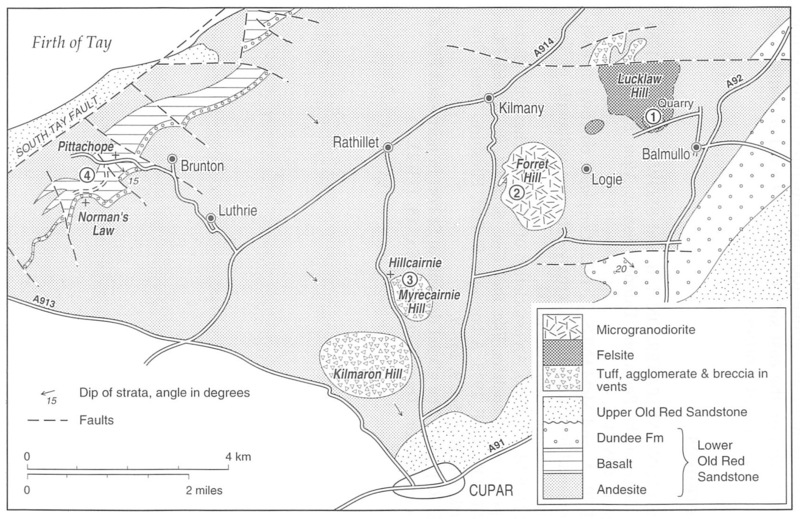 The low ground between Largo and Kirkcaldy is underlain by Upper Carboniferous Coal Measures, soft rocks with few natural exposures, but giving rise to good farm land. Westwards high ground reappears behind Kinghorn and Burntisland where it is due largely to volcanic rocks, both lavas and necks of old volcanoes of Lower Carboniferous age. Benarty, south of Loch Leven, is capped by a continuation of the Midland Valley Sill bordering the south side of Stratheden. 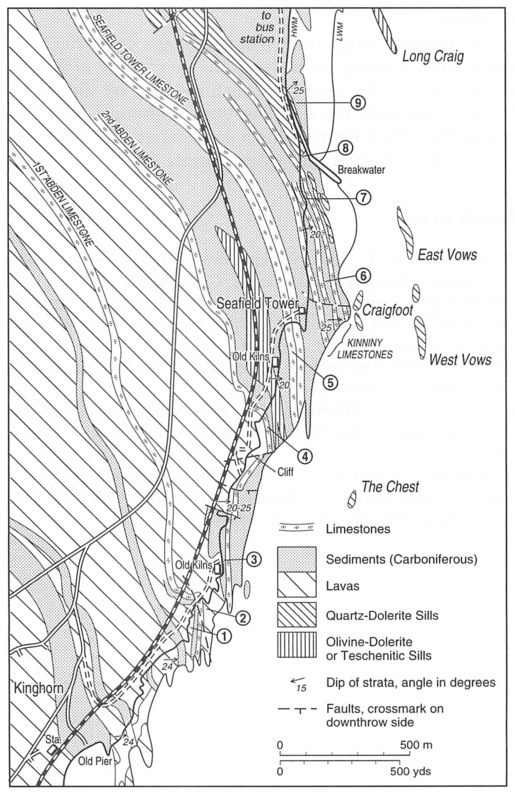 The prominent headland at North Queensferry at the north end of the Forth bridges is also part of the Midland Valley Sill, while the Isle of May at the entrance to the Firth of Forth is a teschenite sill. 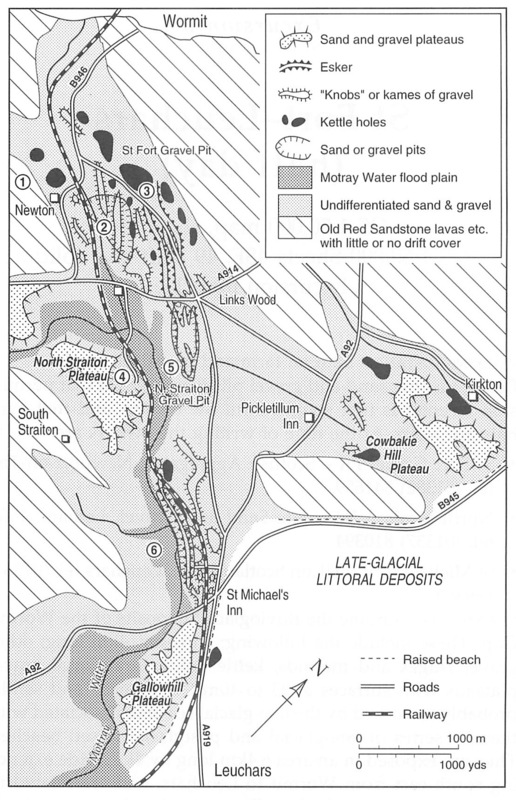 Glacial deposits, both till and gravels and sands, are widespread and the latter locally give rise to characteristic land forms, e.g. at Loch Leven, Collessie, Leuchars and Forfar. The passage of ice has 'rounded the corners and smoothed the edges' over much of the area though this effect is gradually disappearing through post-glacial weathering and erosion. This smoothing is in marked contrast to the deep glacial erosion in parts of the Highlands. The whole-day and half-day excursions are designed to illustrate the geology of the area. Most of them are or were excursions run from the Department of Geography and Geology, St Andrews University. Two can be reached from St Andrews on foot; the remainder require transport and in a number of cases it is helpful to be dropped at one point and picked up at another. 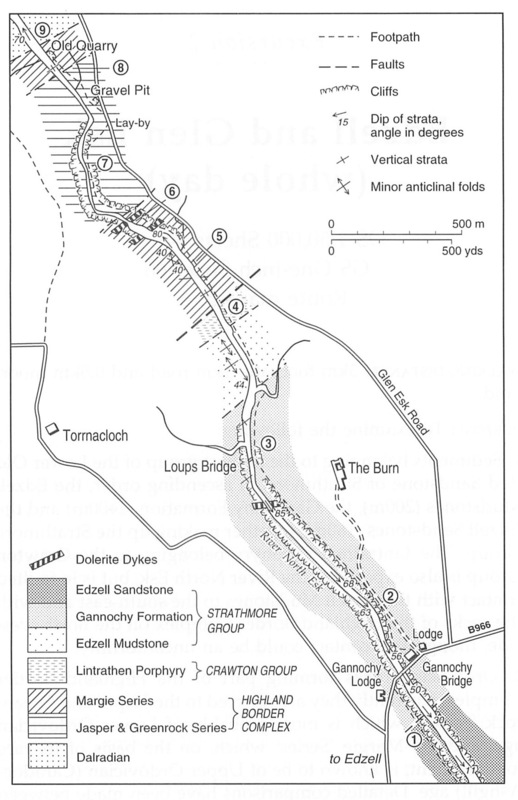 References to the appropriate maps and literature are included with each itinerary, but for the area as a whole the 1/250,000 Tayforth Solid Geology Sheet 56N 04W of the British Geological Survey is useful. One-inch to the mile or 1/50,000 Geological Survey maps are available for most of the area and are listed at the beginning of each itinerary with the prefix GS. Six-inch to the mile or 1/10,000 geological maps of some of the coalfields are published; others are available for inspection at the office of the British Geological Survey in Edinburgh. Out of print maps may also be consulted there. Ordnance Survey maps are also listed for each itinerary with the prefix OS and refer to the 1/50,000 maps of Scotland. The British Regional Geology Handbooks The Midland Valley by I. 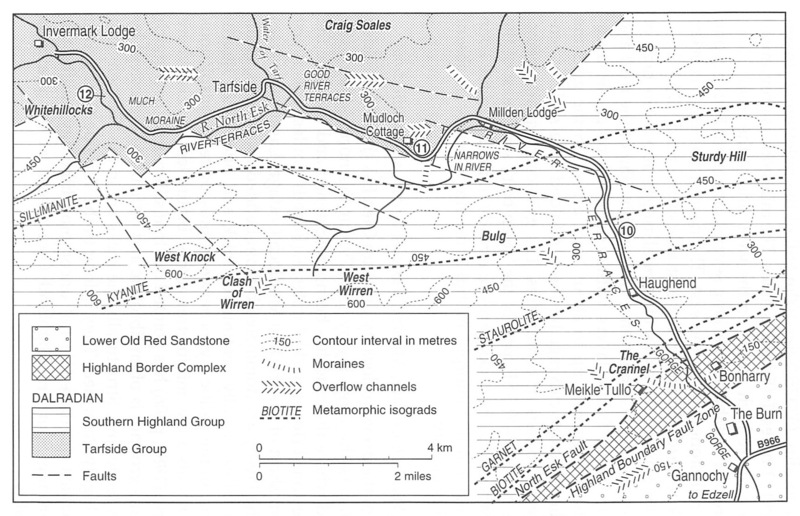 B. Cameron and D. Stephenson (1985) and The Grampian Highlands by G. S. Johnstone (1966), both published by HMSO, contain abundant references and are revised from time to time. 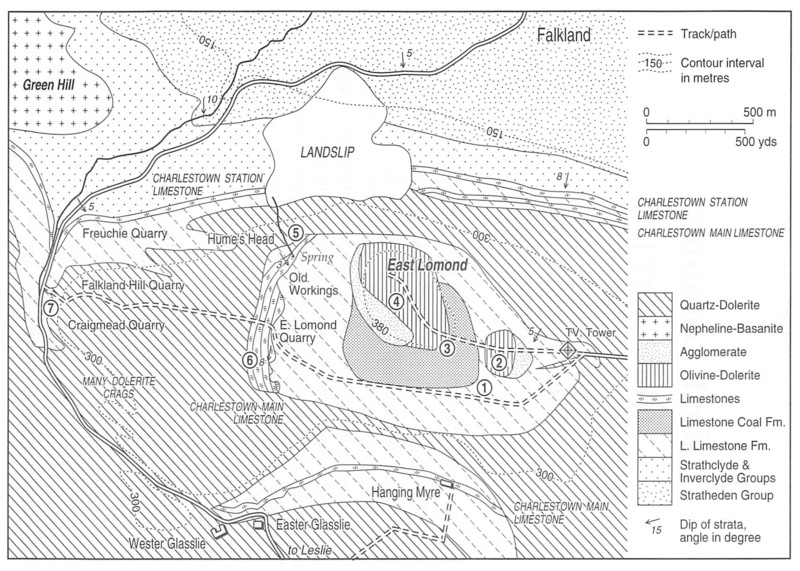 For a treatment of the whole country the Geology of Scotland edited by G. Y. Craig (1991) is comprehensive and has long lists of references. Readers not familiar with geological terminology are referred to the Penguin or other geological dictionaries. The names of fossils have been kept to an elementary level deliberately in the belief that names such as Productus are more meaningful to the non-specialist. Full faunal lists for most of the fossil localities in Fife are to be found in the publications of the Geological Survey, e.g. 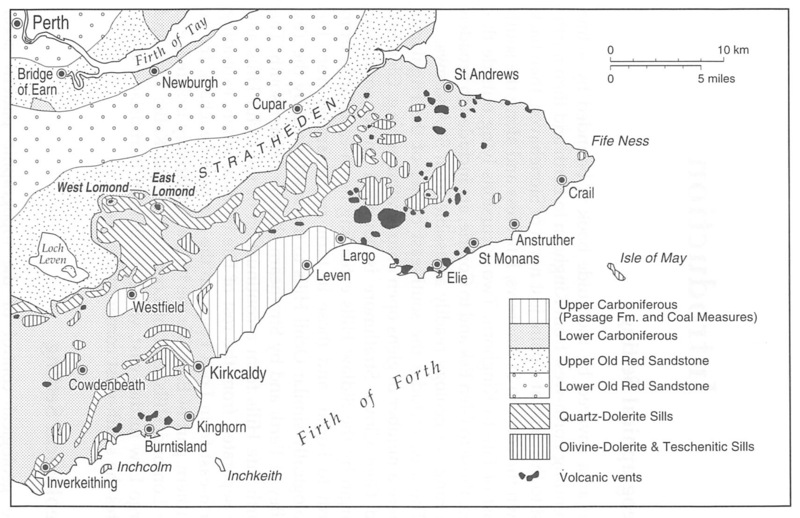 Geology of East Fife (Forsyth and Chisholm 1977). (Map 1) indicates the location of the 18 excursions. Coastal excursions almost all require mid- to low tide and for Excursion 15 (Kincraig) low tide is essential for access. 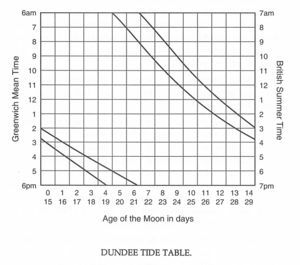 To determine the time of high tide on any particular day, note how many days after new moon or full moon it is. New moon is marked on the chart as day zero and full moon as day 15. Then read along the bottom of the chart to the day in question and follow the column up. The time of high tide lies between the two heavy black lines which cross the chart obliquely. Spring tides, those with the greatest range, occur approximately 2 days and 16 days after new moon; while neap tides, those with the least range, occur approximately 9 and 23 days after new moon. High tide is 60 minutes earlier at Stonehaven. High tide is 50 minutes earlier at Fife Ness. High tide is 40 minutes earlier at Methil. More precise times can be obtained from the Admiralty Tide Tables. The eighteen excursions in the guide are designed to cover the salient features of the geology of the area extending north from Kinghorn to Stonehaven. They are numbered from north to south and are intended as whole day and half day excursions, the approximate timing being indicated with each itinerary. Each excursion is illustrated by one or more maps on which the localities to be visited are indicated by numbers. There is a brief description in the text for each locality and each itinerary starts with an indication of the walking distance, purpose of the excursion and the route from St Andrews to the area to be examined. The section on the geology of the area indicates which excursions serve to illustrate the different aspects of the geology. Metamorphic rocks can be seen on Excursions 2 and 4, and the Highland Boundary Fault together with the Highland Border Complex on Excursions 1 and 2. Among igneous rocks, plutonic rocks can be seen on Excursion 4, sills on Excursions 3, 8, 16, 17 and 18; dykes on Excursions 1, 2, 3, 10, 13, 14 and 15; while lavas are well exposed on Excursions 3, 5, 7 and 18. 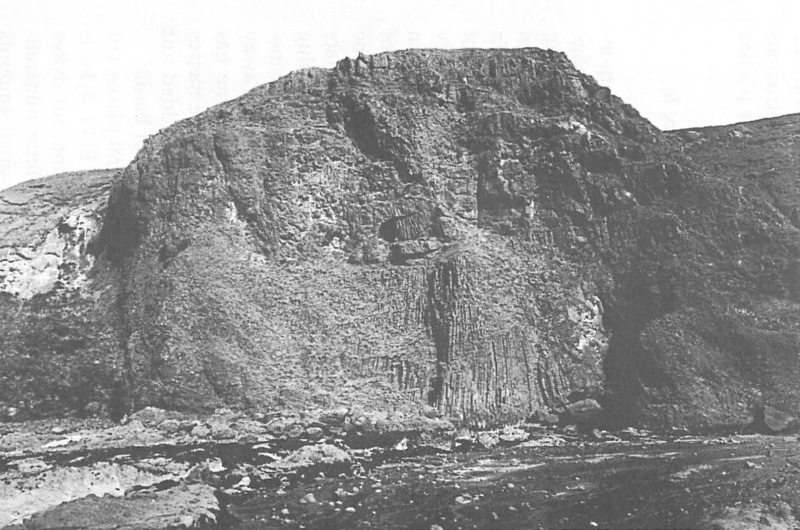 Volcanic necks are abundant in Fife and are magnificently exposed on the coast; they can be examined to advantage on Excursions 7, 10, 13, 14, 15 and 16. Sedimentary rocks can be seen on almost all the excursions, those of the Lower Old Red Sandstone on Excursions 1, 2 and 3 in particular. The Upper Old Red Sandstone can be seen on Excursions 1, 8 and 17 mainly; the lowest Carboniferous on Excursions 9, 10, 11, 12, 13 and 17 and the Carboniferous Lower Limestone Formation on Excursions 12 and 18. 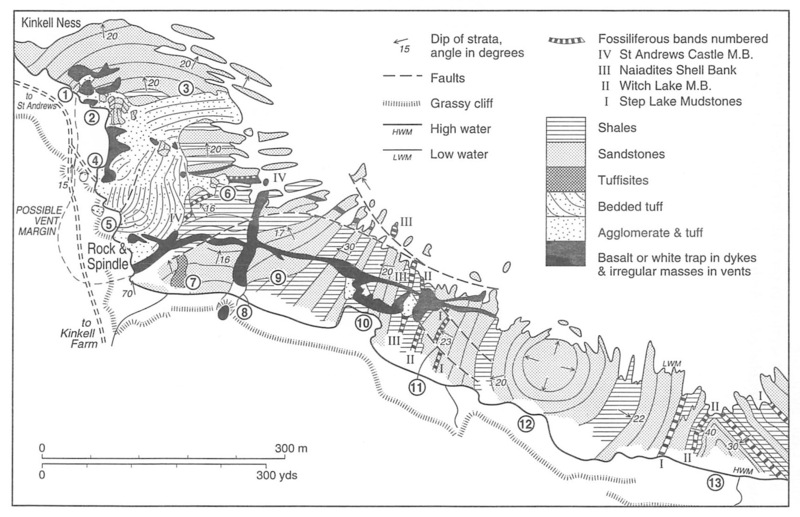 Quaternary sediments are well displayed on Excursions 3 and 6. A number of itineraries lead over high ground and these provide good views of the regional geology extending over the north-east part of the Midland Valley of Scotland. Such views are found on Excursions 3, 7, 16 and 17. Two excursions are particularly suitable as introductory ones. Excursion 9 introduces common sedimentary rock types plus folding and faulting, while Excursion 10 displays particularly straightforwardly volcanic necks and their stages of development. Which excursions anyone will choose will depend on their interests and time available together with the state of the tide since many excursions are inter-tidal, but the remarks of Sir Archibald Geikie, then Director of the Geological Survey, remain apposite: 'If I were asked to select a region in the British Isles where geology could best be practically taught by constant appeals to evidence in the field, I would with little hesitation recommend the East of Fife as peculiarly adapted for such a purpose. Every teacher of the science appreciates the value of a shore-section where the rocks have been dissected and washed clean and bare by the tides. Round its long stretches of coast-line, the East of Fife presents an almost continuous succession of such sections which for variety, instructiveness, and accessibility have hardly any rivals in the country.' (Geikie, 1902, p iv). All inland exposures are on land belonging to a landowner whose livelihood and that of others can be affected by your behaviour. It is important and a courtesy that permission should be sought before crossing farmland. Do not walk through standing crops. Gates should be shut and stiles used wherever possible. In working quarries it is essential, and indeed required by law, that permission to enter is sought beforehand and a safety helmet worn. Common sense points to care and caution near steep slopes and cliffs. When collecting, if this is necessary, care must be taken to leave the site in a clean and tidy state, i.e. in the condition that you would wish to find it yourself. When hammering rocks remember those around you: many accidents have been caused by rock splinters. Already fallen rocks often provide good samples without having to dislodge more material. Sketches and photographs often provide much of the information wanted. Do not collect from walls or undermine buildings. Do not interfere with machinery, livestock or crops; they are all part of the livelihood of someone in the vicinity. On coastal excursions it is important to know the state of the tide, both to ensure exposure of the rocks and also for safety. 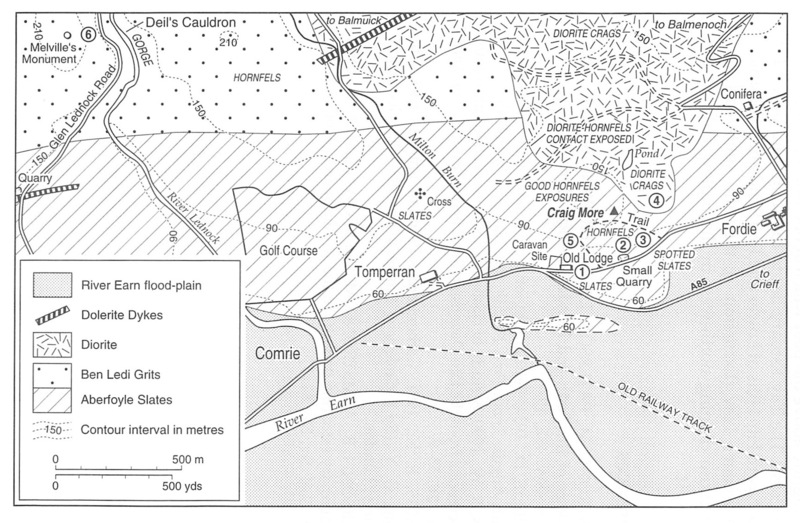 This is particularly important on Excursion 15 to Kincraig, Elie. A tide table is included to allow timing of excursions. 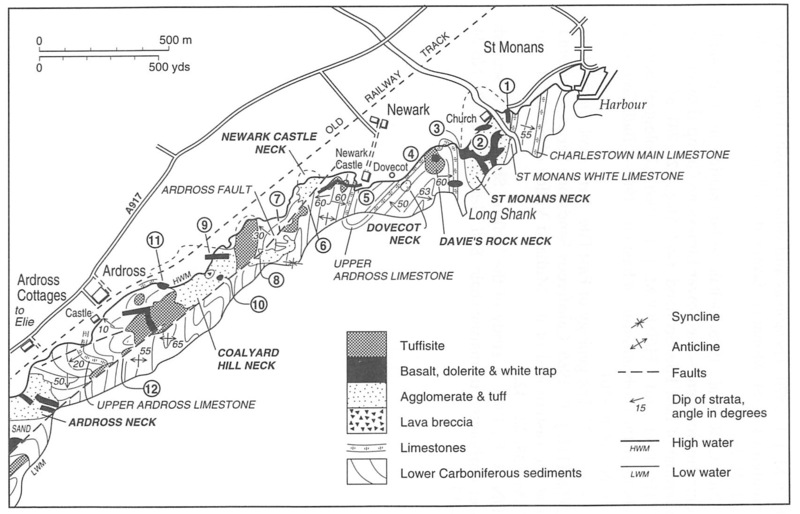 Sites of Special Scientific Interest, known as SSSIs, are designated by Scottish Natural Heritage and hammering of rocks is not permitted in these. Loose material on the beach may, however, be collected. Much of the Fife coast is covered by SSSIs, in particular the following stretches including the itineraries within them: Burntisland to Kirkcaldy; East Wemyss to Anstruther; St Andrews to Boarhills; and Wormit to Balmerino. Inland in Fife, Bishop Hill is also a SSSI. North of the Tay, Whiting Ness at Arbroath is a SSSI as are Den of Fowlis and the Gallowflat Claypit at Pitfour.